A big hammer will reset this too. Not going through restore to unlock what I never locked in the first place. Understandable, another override unlock solution would be ideal for this for those who have forgotten the passcodes for Screen Time. 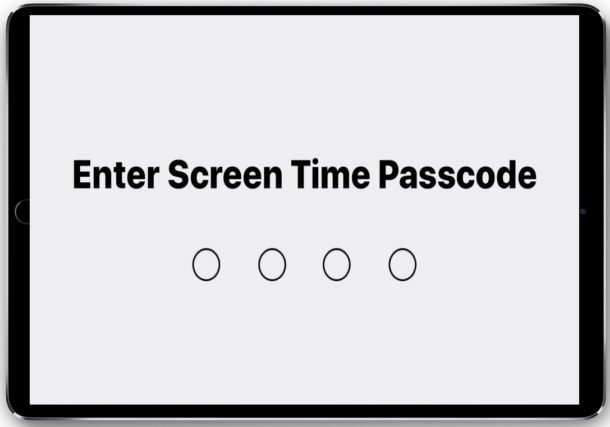 Overall there seems to be a fair amount of confusion with some people who updated an iPhone or iPad and discover that Screen Time has a passcode that they don’t remember setting, when in fact it’s the Restrictions passcode that was set in a prior iOS release. Maybe you are such an absent-minded person who likes forgetting password/passcode when you want to reset iPad to factory settings, because your iPad is stuck at recovery mode, or you want to restore iCloud/iTunes backup, or you want to erase it before you sell the used iPad, even to clear cache to free up memory space. So, you can’t just log into your Apple account with your AppleID and force a reset? I get this is about security concerns, but it just replaces that with data-loss concerns.